Part of the fun of remodelling your bathroom is that you get to choose a whole new look. You get to breathe new life into your bathroom. Tiling looks great, but what happens if the budget doesn’t allow for a fully tiled wall? Alternatively, what if you don’t want any tile at all? 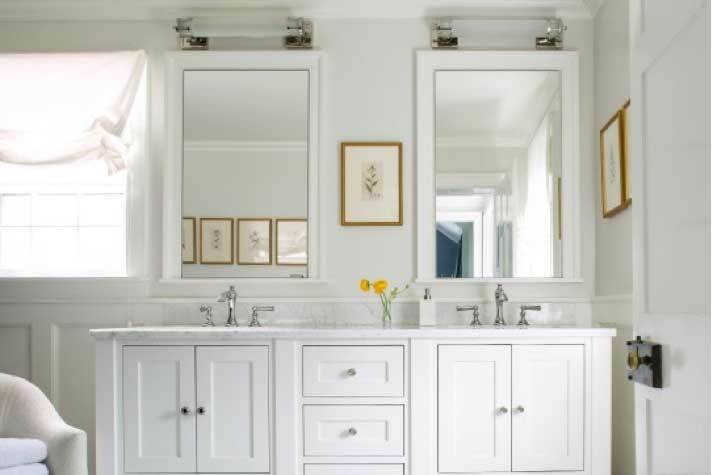 Painting can be a great alternative, but you do have to choose the best paint for a bathroom. In this post, we will go through exactly how you can choose the right paint for every surface of your bathroom. What type of paint is best for bathroom walls? Bathroom walls can take quite a beating. There is the increased humidity and condensation to contend with, which why it is best to pay a bit extra and get a paint formulated for use in bathrooms. This is especially true in bathrooms that see much wear and tear. If, for example, you have a guest bathroom that only gets used on high days and holidays, you might be able to get away with standard paint. Generally speaking, though, it is best to stick to a paint that will repel water. What’s the best paint for bathroom cabinets? The same rules pretty much apply here as well. You want a pearl or semi-gloss finish so that the surface also repels water. The application itself will depend on what materials make up the cabinets. You’ll need to ensure that they are adequately primed before applying any new paint. A while back, you had only one choice when protecting your walls against humidity. Unfortunately, that meant using enamel paint. This, in turn, often meant settling for a glossy sheen on your walls and a rather limited colour palette. Fortunately, those days are long gone. Latex and acrylic paints such as those offered by industry leader Benjamin Moore, have come a long way. A pearl or semi-gloss finish is ideal for an area that sees many visitors. You could look at an eggshell sheen if your bathroom isn’t used all that much. As a general rule, the glossier the paint, the better it can repel water. Moreover, if you want to prevent problems with moisture or mildew, that is exactly what you want. Bathrooms can be a little trickier to decorate because of the added humidity and condensation. That said, as long as you choose the right paint, and prepare the wall properly ahead of time, you will get great results. Using a specialty paint will cost you a little more upfront, but the finish will last longer and be easier to maintain. With the exception of Aura Bath & Spa, if you use a matte paint, the water won’t be repelled as easily and could sink into the walls. This means that you will have to repaint sooner than planned and that you run the risk of mildew growing on the walls. A good pearl or semi-gloss finish is the best way to keep your walls and cabinets looking great for longer. Need More Help Choosing the Right Paint for Your Bathroom? Contact Mayfair Paint N Paper for expert help in bringing your project to life today!